My artistic journey began as a very young child, and it is still a passionate journey. I am German born, but grew up in Australia. After studying Art and Craft at TAFE in Adelaide in 1983, I began teaching painting, drawing and ceramics at TAFE in Adelaide. As well as conducting private classes. I established myself mainly as a portrait artist, but I also had several solo and group shows there before moving to Sydney in 1995. I painted many prominent people, including Dame Roma Mitchell, politicians and jockeys, and famous race horses. It was a portrait of Colin Hayes the horse trainer, with his favourite horse that won the Packer’s award at the Archibald Exhibition in 1993. That painting is now hanging in Lindsay Park. I like to travel and paint in different environments, and sometimes I will simply be inspired by music or an emotion that I wish to express. I often like to add layers of meaning to my images . Colour is very important to me, I believe it influences our lives on many levels. I have studied many aspects of colour and this allows me to work intuitively with colour and the concepts of yin and yang, which are echoed in the strong relationship contrasts in my work. I constantly explore watercolours, acrylics and mixed media, and enjoy them all, exhibiting regularly in Sydney as well as in Adelaide. I have won 86 prizes in various art shows since 1983; 28 of these were first prizes, and 58 second and commendations, including the Packer’s award at the Archibald in 1993. I began teaching in Castle Hill in 1997, and liked to introduce various media to my students. 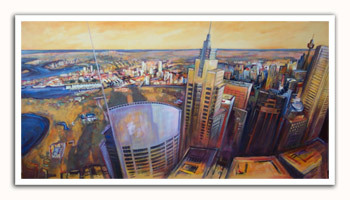 My time in Sydney has now come to an end and I am living and painting in Adelaide once more! I am no longer available for classes.